THE Northern Knights won a thriller over the Dandenong Stingrays on Saturday – but without Nicholas Coffield’s match winning goal with seconds on the clock, they wouldn’t have won the game. Matt Balmer looks in depth at one of their likely draftees. Nicholas Coffield is one of the few Northern Knights players likely to come under consideration to be drafted. Others include Richmond father-son prospect Patrick Naish, who has shown his smarts and skills on the outside, while Jack Petruccelle‘s lightning speed and marking ability makes him one of the more exciting players in the draft pool. Coffield is one who hasn’t got a lot of plaudits and his start to the season has been superb flying under the radar to some. The 190cm outside midfielder is a good size and is averaging 21.5 disposals at 81 per cent efficiency, as well as averaging a goal a game. 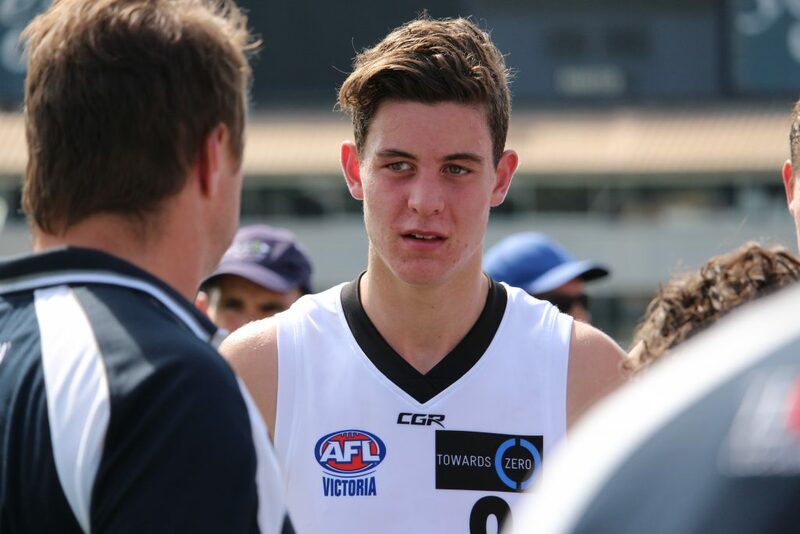 He also possess elite speed, running a 2.89s 20m sprint time in the TAC Cup Preseason Testing. By foot Coffield is kicking at 80 per cent, which is very good. His calmness and compose under pressure is evident, able to find a target in dangerous situations in the defensive half of the ground. A large chunk of his disposals on Saturday saw him stationed behind the ball when the Knights were defending into the wind and Coffield played as the general manning the defensive troops. His leadership is excellent, with Coffield named as the Northern Knights captain – evident in his stirring speech below. One passage of play in the opening quarter saw him ‘dig deep’ and continue chasing the Dandenong Stingrays players on the wing. Despite not winning the ball or being able to get close enough to lay a tackle – his desperation for the ball was evident. He patrolled the corridor, but mostly sat in the defensive half of the ground bar a spurt out of the goal square. A shank off the boot after collecting a one-two nearly resulted in an easy Stingray goal but the chance was missed. The third quarter saw him clunk a great contested mark outside defensive 50 and immediately use his good vision to spot a target on the opposite site of the ground. He was largely used again as a general in defence, to ensure the Stingrays couldn’t take advantage of the wing. This saw him attend just the one stoppage for the quarter. He got around two Stingrays players with ease on the wing and was able to make a pinpoint pass to Ethan Penrith, who dropped the chance. His composure was also evident when he took multiple kick outs – looking for short options and free teammates rather than kicking long to a contest. The final quarter saw him again start in the centre bounce next to the dangerous Tom Murphy. He was unfortunately stiff to be pinged for holding the ball deep inside Dandenong’s forward line resulting in a goal. Coffield just knew he needed to help his team over the line and despite being tackled by two opponents at one stage – he was able to clear the ball long by foot. When the game was hot he was at the centre bounce at the 23rd minute mark – and the rest is history as Coffield put home the sealer from 45m out! Coffield begun both the second and fourth quarters in at the centre bounces – the two quarters where Northern had the wind advantage. He won just the one centre clearance for the day – winning the ball at the front of the pack and kicking it short inside 50. When the Knights needed him to patrol the game from defence in the third term – they moved him there using other midfielders Braedyn Gillard, Jamison Shea, Jack Petruccelle and Ethan Penrith through the stoppages. There were a total of 76 stoppages for the day, with Coffield attending 26. Nicholas Coffield has a good chance of being drafted with his composure under pressure in the defensive half of the ground really showing as his strength. His tackling numbers – averaging just 2.2 is an area of improvement for the outside midfield. He does seems likely to find a home in the second or third round at this stage, but with a long season still ahead of him there are plenty of games that can affect his draft stocks.